Disston made a lot of backsaws over the years, but the vast majority of them were the model No. 4. Relatively few No. 5 backsaws with the brass back were sold in the US; they seem to have been more popular in England and Australia. The No. 9 isn't seen much either. For dovetailing, Disston made the Nos. 68 and 70, starting in the early part of the 20th century. These were the thinnest, smallest backsaws Disston made, with a blade thickness of 0.018". Disston never carried an open-handled backsaw in its catalog, with the exception of the "Jackson" brand backsaw in the late 19th century and the "Davis" in the early 20th century. Jackson was a second-line brand with lesser quality in materials and finish than the Disston brand saws. It is shown with an open handle in the 1890 catalog. Later the Jackson saw was made with a closed handle only. Davis was of similar quality and featured an open handle in the 10 and 12 inch lengths. This saw is a genuine Disston and Son open-handled backsaw. It dates from the 1865-71 period when the company used that name. It has a 6-inch blade, 2" wide under the spine, 0.025" thick; applewood handle; and features two split nuts with no medallion. While the stamp on the spine is too light to read the "and Son" part of the name, the logo's shape matches other backsaws from that period precisely. The detail in these photos of the handle show its condition is original and has not been modified in any way. These saws have been reported by collectors, and there has been some speculation as to whether the few that turn up are authentic or user-modified. This one has not been messed with and the tool marks are still visible in places. I had thought these two were No. 70 dovetail saws because they didn't seem to be anything else. 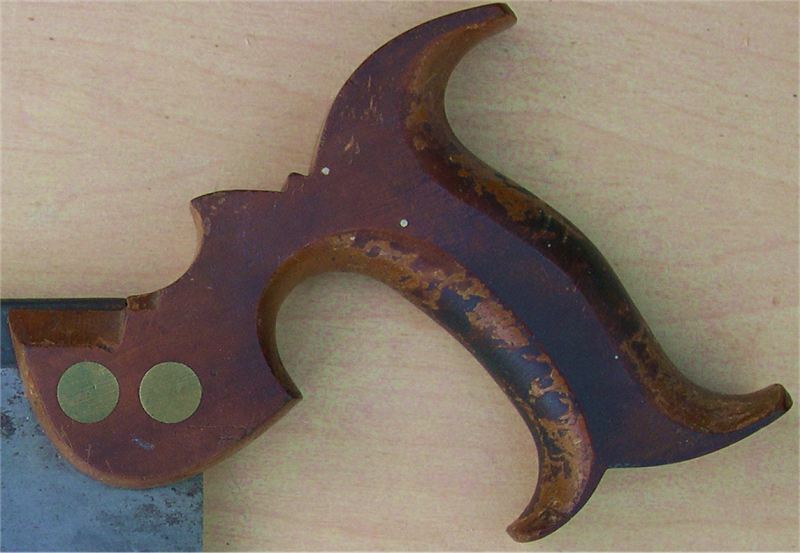 The top saw is from the 1890-1920 era, based on the shape of the handle and the overall appearance. Notice that it has the same general shape and dimensions as the earlier saw, featured above. 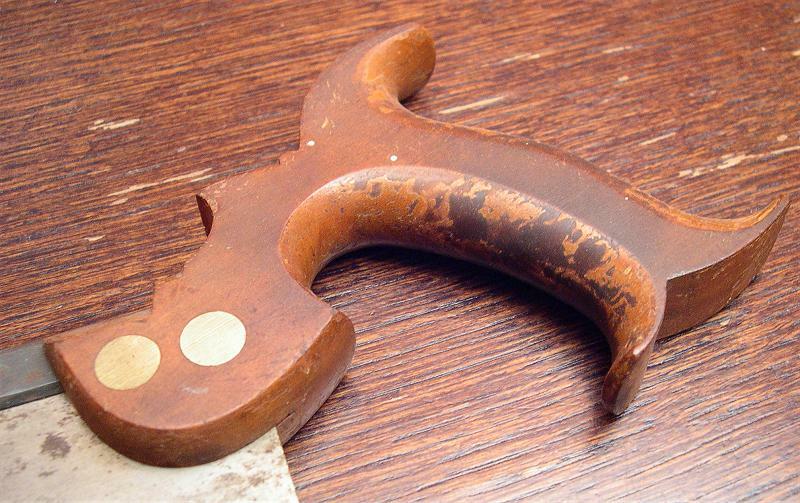 The handle's lower horn has been cut either to remove damage or to better fit the user's hand. The saw in the lower photo is the same shape, but features a medallion of an undetermined design. This is a real No. 70 dovetail saw. It looks nothing like the other saw shown above. It has a much smaller back, which is brass-plated steel, and the handle is smaller and a different shape. The saw shown below has a blade 12 inches in length. An open handled Disston backsaw has also been seen with a 16" blade. It was set up with a Miller's Falls miterbox. It's clear that Disston made open-handled backsaws with the "Disston" brand name for a long time. What is not clear is why they were not advertised or marketed in any way. They seem to be custom-ordered saws that used materials and shapes from other saws Disston was selling. 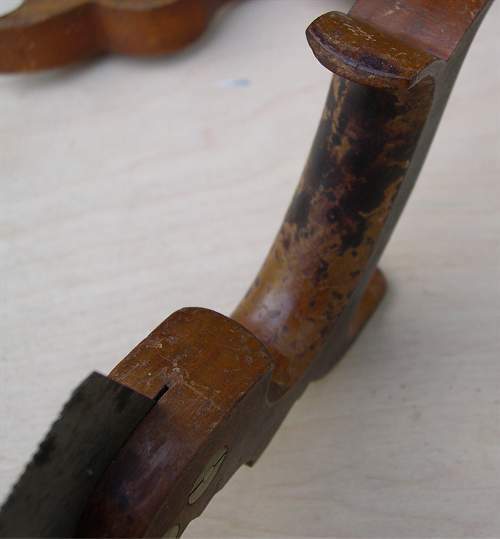 The general shape of the handle is similar to that of the Davis saw, the main difference being the use of applewood and finer detail on the Disston saw. 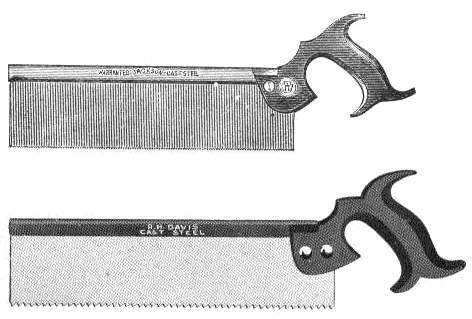 English and Scottish dovetail saws the size of the saw featured in this article were common, but they were typically made with blades 0.018" or 0.020" thick, which is 20 to 28% thinner than the Disston saw. Whether issues of quality control or some related cause prevented Disston from selling dovetail saws until they started making the Nos. 68 and 70, we can only speculate. There was a market for dovetail saws in the US during the 19th century because they turn up here frequently as antiques. But the saws are exclusively British. While this saw is of fine quality, it doesn't have the narrow kerf of a classic 19th-century dovetail saw. In function, it works as well as a same-sized No. 4 backsaw with a closed handle. Its greatest value is as a collectable.